Add it to your everyday carry bag and you can stop buying bottled water. Just refill it at a water fountain, the tap in the office restroom, or any typical water supply. It’s cheaper than buying bottled water. Cost ranges from $20 to $30, but it yields about 600 liters of water before a filter change is needed. If you’re bugging out, you can refill the bottle just about anywhere, even a ditch, pond, or stagnant rain barrel. Yeah, it sounds gross, but if you had to do it you’d be glad you had it. We have used our batch of six bottles for about a year. They have performed flawlessly, with no defects or failures of any kind. We particularly like the fact that they’re made of a soft plastic that is squeezable. The Berkey company has a FAQ where you can learn more. You need one for everyone in the family. We found a great deal: 3 bottles for $79, and free shipping. And best of all, it’s through Amazon, which has exemplary customer service. Buy the Sport Berkey 3-pack — you won’t regret it! 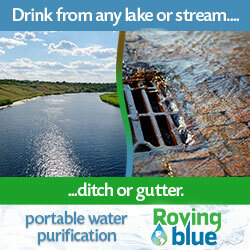 It’s great for travel in countries with tainted water supplies. It does not filter fluorine. Fluorine reduction filters are bulky because they require so much media. It would take up most of the room in the bottle and wouldn’t be practical. We drew water from a pond, filtered the water, and drank it right on camera. Despite what you think you see, no one suffered any ill effects. I think this is the funniest video you've made! By the way, have you had to buy new filters for your Sport Berkey? How long did they last? Never worn one out yet. But I'm glad you mentioned it, because I probably should order some to have in stock. ok, I laughed at the end, but I'm getting one of these for my bob anyway. Also one for my hubby. Tired of him buying bottled water all the time. Great video. fan of your blog. This has been very much appreciated information!